Today's Post is all about my precious pride & joy beloved Rose Gold Watch from ASOS. I had been lusting over a MARC by MARC JACOBS or a Michael Kors for weeks before i decided to opt for a cheaper version for now and managed to grab a bargain on ASOS. 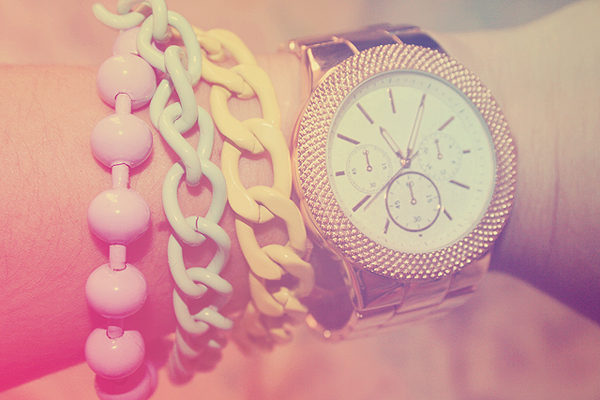 Most watches you see on people always tend to have a little "bling bling" to their wrists so i opted for some pastel chain bracelets too. I love how the Rose Gold watches are just a bit different then the normal gold or silver watches, it is like an in-betweener. WHAT IS YOUR PREFERENCE WHEN IT COMES DOWN TO WATCHES? Love those bracelts! Cute blog! Following now :) Check mine out?